Although my friend Paul Harvey hasn’t lived in his native Dorset since the early 80,s he still likes to add species to his Dorset list, so we headed to Longham Lakes. The first bird we found was a female Smew and I had a very pleasant shock when a pristine male Smew (quite rare in Dorset) flew over a few minutes later. In due course we found the female BB;ue-winged Teal and had good views. We continued on to Blashford lakes where we failed to find the drake Ferruginous Duck but there was a good selection of other wildfowl. Paul had to leave at this point to catch his flight back to Shetland. It had been a real pleasure birding with Paul again and I look forwards to seeing him in Shetland later in the year. With a major rarity staked out in the New Forest I headed for Hawkshill Enclosure but had to negotiate the odd flooded road, a legacy of yesterdays storm. The Dark-eyed Junco, a sparrow like bird from North America showed well if a little distantly, after about an hours wait. This is the second time I have seen this species in the UK, although I have seen many in North America. I continued on to Blackwater Arboretum, where after a long wait, a number of Crossbills and Hawfiches appeared in the gathering gloom. I made a quick visit to the Blashford Lakes on my return but there was still no sign of the Ferruginous Duck. On the 5th I returned early to Ivy Lake at Blashford where I discovered the Ferruginous Duck sheltering from the vicous wind. Unlike yesterday the Woodland Hide feeders were stacked with birds, but I couldn’t find any Bramblings, a target bird for my year list. Further disappoinment occured when the nearby ‘staked out’ Bewick’s Swans appeared to have got blown away, when I failed to find any Egyptian Geese in the Avon Valley and when I found the road home closed due to a tree felled by the gale. 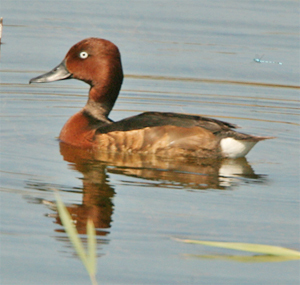 However good views of the Ferruginous Duck and some good photo opportunities made the day well worthwhile.